​The $300,000 to $449,999 range remains the most active price point in the residential market, accounting for 43 per cent of home sales while the $500,000 to $750,000 price range continues to represent one in five of all residential home sales this past month. 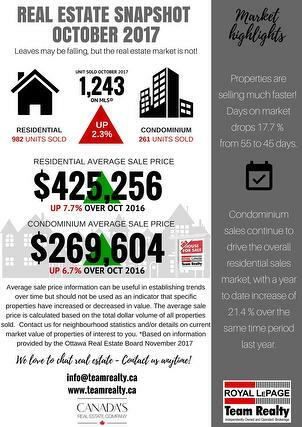 Between $175,000 to $274,999 was October’s most robust price point in the condominium market, accounting for almost 53 per cent of the units sold. 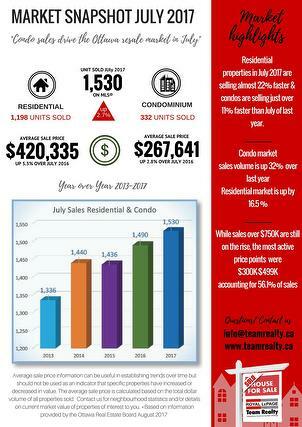 Residential sales volume down, Condo sales volume up...prices up. Members of the Ottawa Real Estate Board sold 2,070 residential properties in June through the Board’s Multiple Listing Service® System, compared with 2,163 in June 2017, a decrease of 4.3%. The five-year average for June sales is 1,914. 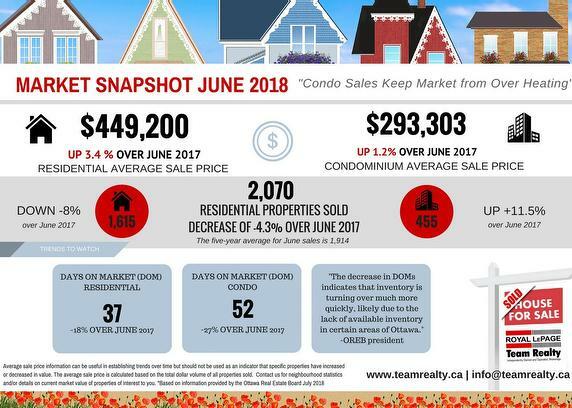 June’s sales included 455 in the condominium property class, an increase of 11.5% from June 2017 and 1,615 in the residential property class, a decrease of 8% from a year ago. 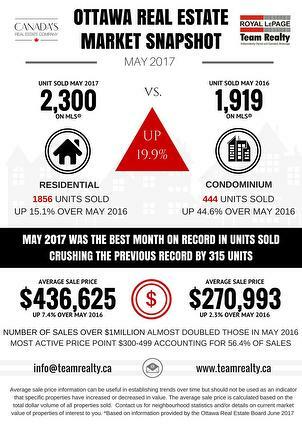 Year-to-date, sales are up 9% over the same period last year, and Royal LePage Team Realty had a record April, with sales up 30% over any previous April sales. Driving prices in the same period, in some markets, is a reduction of 23.7% in listings compared to the previous April. 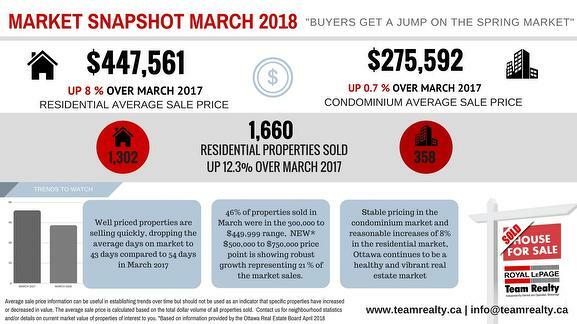 The most active sector of the Ottawa Real Estate market continues to be in the $300,000 to $499,900 range at 46% of the market, but a shortage of inventory is driving higher priced segments as well. Members of the Ottawa Real Estate Board sold 771 residential properties in December through the Board’s Multiple Listing Service® System, compared with 711 in December 2016, an increase of 8.4 per cent. The five-year average for December sales is 687. December’s sales included 205 in the condominium property class and 566 in the residential property class. Members of the Ottawa Real Estate Board sold 1,239 residential properties in November through the Board’s Multiple Listing Service® System compared with 992 in November 2016, an increase of 24.9%. The five-year average for November sales is 1,001. The most active price point in the residential market is the $300,000 to $450,000 range, accounting for 46% of the market. While the most active price point in the condo market, between $150,000 and $275,000, accounts for 66% of the market. October saw the condominium market in Ottawa continue its strong run, as prices continue to bounce back from recent lows. Activity across the market continues to be strong....over the November 3-5 weekend there were 78 new listings in all property categories across the Ottawa Board's MLS system, with 81 Conditional sales....as Conditional Sales outnumber new listings and if Solds hold steady, we should see a stronger Sellers' market developing. 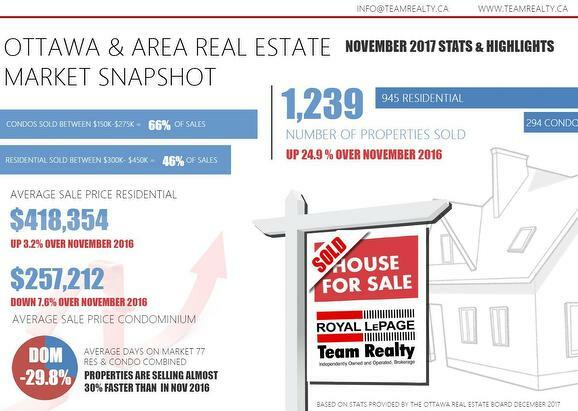 Members of the Ottawa Real Estate Board sold 1,243 residential properties in October through the Board’s Multiple Listing Service® System, compared with 1,214 in October 2016, an increase of 2.3 per cent. The five-year average for October sales is 1,165. 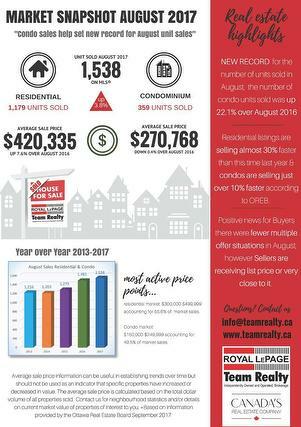 If you’ve been following Ottawa real estate this year you’ll know that it’s been a record breaker, particularly with the number of sales year over year. 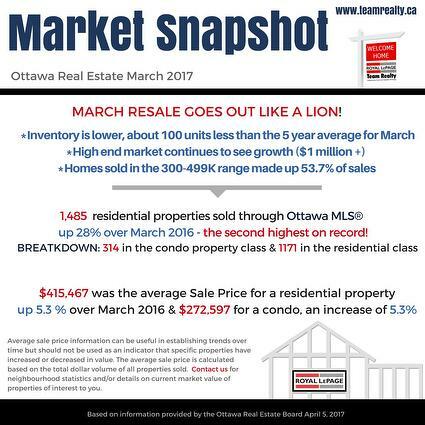 According to the Ottawa Real Estate Board statistics, in 2017 the listing inventory has been lower, average sale prices are steadily increasing, properties are selling faster and there have been more multiple offer situations. While we may be trending towards a “Seller’s Market”, unlike Toronto and Vancouver, there are still plenty of opportunities for home buyers to find affordable housing in and around our beautiful city! 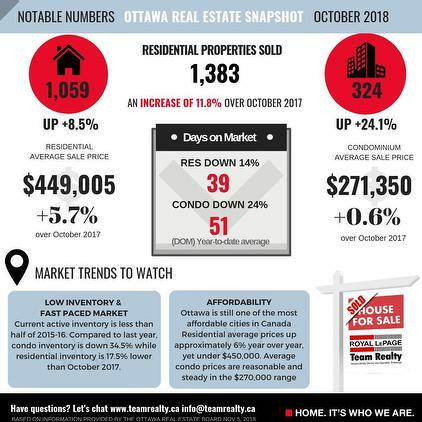 The Ottawa real estate market may be stabilizing, as condo sales continue to increase, and prices appear to show a bit of a turn-around from the activity of the previous years. While residential inventory is down, and prices are up, we are seeing fewer multiple-offer situations. If you're interested in sales and prices for a particular area of the City, please let me know. If you know of anyone thinking of purchasing or selling a property, I'd be pleased to assist them....you can send me their contact information and I'll follow up with them. 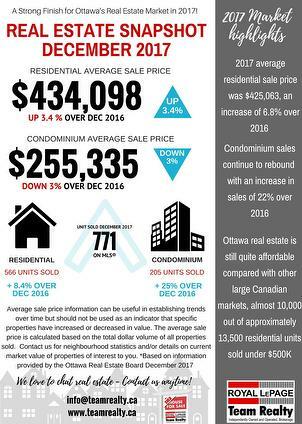 Generally, areas of Ottawa immediately to the south and west of downtown saw the largest increases in home prices, while sales of homes in areas to the east experienced the smallest hikes in prices. The most significant price increases of single-family homes occurred, as they have for several months running, in the Hunt Club and Windsor Park areas just north of the international airport. 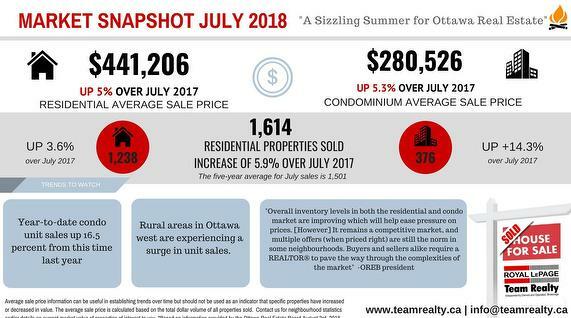 The strong Ottawa real estate market continued through June with a Seller's market for residential properties, and a Balanced market for condo properties. We saw the CDOM (Cumulative Days on Market) for residential properties drop to 60 days from 70, while condo properties dropped from 102 to 97 days. 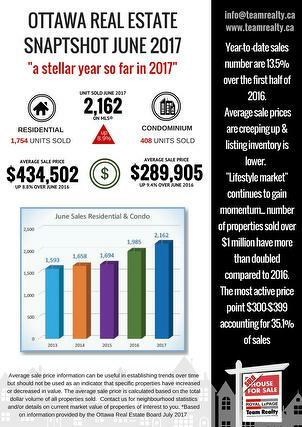 This might be driven by a decrease in listings over the same period as last year, and a corresponding increase in sales. 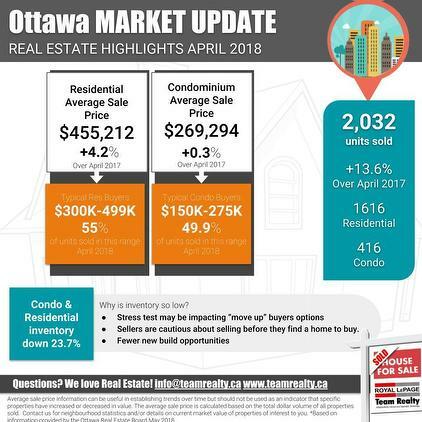 Here's a quick look at what was happening in the Ottawa market in May.....we're trending to a Seller's Market, and there is still lots of time to get your property listed to take advantage of it. LePage House Pricing Survey (2) released today. When broken out by housing type, the median price of a standard two-storey home climbed 5.6% year-over-year to $437,247. During the same period, the median price of a bungalow grew 6.9% year-over-year to $411,375, while condominiums rose 3.0% year-over-year to $324,455. home rose 13.9% year-over-year to $681,728, and the price of a bungalow increased 11.0% to to $490,018. 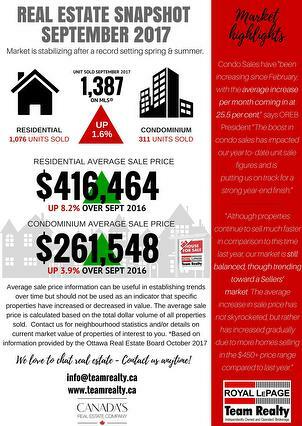 During the same period, the price of a condominium increased 8.9% to $372,638. While the majority of housing markets in Canada posted modest gains, price appreciation across much of Ontario significantly outpaced the rest of the country. Meanwhile, the pace of year-over-year home price appreciation in Greater Vancouver was noticeably lower than the historic highs witnessed in 2016. 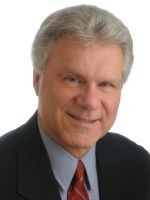 Significant home price appreciation, caused by market dynamics similar to those that have driven housing activity in the Greater Toronto Area, is being seen across the entire “Golden Horseshoe” region of south-central Ontario, and as far away as Windsor and London in southwestern Ontario. In fact, the torrid pace of home price appreciation in much of Ontario contributed almost half of the national aggregate home price increase in the first quarter, with the rest of Canada appreciating by a healthy, but much lower, 6.4% year-over-year when excluding all Ontario-based regions. About Royal LePage Serving Canadians since 1913, Royal LePage is the country’s leading provider of services to real estate brokerages, with a network of over 17,000 real estate professionals in more than 600 locations nationwide. Royal LePage is the only Canadian real estate company to have its own charitable foundation, the Royal LePage Shelter Foundation, dedicated to supporting women’s and children’s shelters and educational programs aimed at ending domestic violence. Royal LePage is a Brookfield Real Estate Services Inc. company, a TSX-listed corporation trading under the symbol TSX:BRE. The Ottawa Spring market may be coming in early this year!